It’s autumn in Australia right now. The weather has been pretty good for autumn giving us a few warm days in a week. Most afternoons are still nice to go out and about and I am managing to take Chhori to parks often after work. She loves going to the park now as she can run around or play on the swing or slides. I love seeing her so happy. As she is home with my parents most of the days, it is nice to see her running around after we get home. It also gives AS and me some time to just relax and watch our daughter without household chores taking up our time. It is a perfect time for me to spend with the most important people in my life. If we don’t go to the park, we just go for a walk but we do go out. But everything is going to change soon. Last weekend we had day light savings switch our clocks an hour back. That means the days are getting shorter and by the time we get home, it is almost dark and we don’t get an opportunity to go out. On top of that winter will be here before would I like it to be and I am so unhappy about it. As you know already, I hate winter and I am going to hate it even more because we will be stuck in our apartment more during the cold season. It was okay for adults to just cover-up and stay in front of the TV but I don’t want that for Chhori. I am not sure how I can help Chhori to be active in the evenings during weekdays if we can’t go to the park. We still have weekends which we will utilise to the fullest but she will miss out going out in the evenings. Please suggest any good activates indoors with a 1 year old. I would like her to enjoy and spend time with us. I am sure I am not the only one with similar issues. Thank you all in advance for helping me every time when I am kind of lost about what to do. 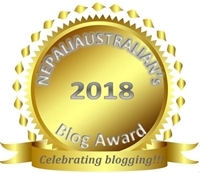 This entry was posted in Being Mum and tagged Australia, australian, chhori, I hate winter, i offically hate winter, M from nepaliaustralian, mum, Nepal, Nepali, Nepaliaustralian, park, weather, winter. Bookmark the permalink. Oh yeah winter time, aint my favorite either any longer. At least you have the luck that it isnt that cold as we had it when living in Finland. Just imagine waking up in the morning to go to work, facing -30 degrees celcius and digging your car out under a half meter layer of snow…. I never want to live where it snows cause I will go crazy I think. I definitely has empathy but it will never work for me. Also, here in almost every shopping malls they have a little children’s area where they can go down the little plastic slides, and play with plenty of other fun stuff that’s there 🙂 Is it common in Australia too? How cold does it get in Sydney during winter? Do you have internal heating during cold months? Maybe an indoor swimming pool with your daughter, or indoor playhouses for children.. There are plenty of them here, but I guess in Australia it’s not so common. It must be so much fun having such a great grandma. I can’t wait for Chhori to be bit older so she understand more and we can do few of those games :). Thank you.